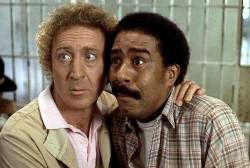 Gene Wilder, at left, and Richard Pryor in "Stir Crazy"
with Richard Pryor. They appeared together in three movies in the 1980s, bracketing the decade, and all of them made me laugh. Wilder passed away last year, but he leaves a legacy of laughs, and some tears, in more than four decades of work. 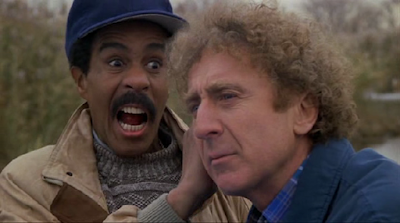 To be honest, I think most of the Gene Wilder movies I saw in the '80s co-starred Richard Pryor. The first was actually still in the 1970s. “Silver Streak”, released in 1976, was the story of a murder on a train travelling from Los Angeles to Chicago. The first time I saw it was in the 1980s though. I was staying over at my friend Mike Hartman’s place in Coaldale. He made some money babysitting for a couple, and we watched it on their cable TV while we babysat. Parts of the film were shot in Lethbridge so, as we watched, we kept looking for signs of Southern Alberta. The most obvious was the High Level Bridge, which was perfect for a movie set on a train. One scene has Wilder disguised as a black man. Pryor puts shoe polish on is face, and teaches him to jive to the music coming from a radio he held to his left ear. The second pairing of Wilder and Pryor is a movie I remember vividly. “Stir Crazy”, released in 1980, was set in prison, where Wilder and Pryor are two men wrongly convicted of robbing a bank, who end up making friends with the other prisoners. There are some absolutely hilarious moments. In one, the warden is trying to torture Wilder into submission. He puts him in the hot box for what should be an unbearable time. When Wilder emerges drenched in sweat, he rejoices that the hot box has helped him immensely, and he begs to go back in for just one more day. He is also hung in the air with chains strapped to both ankles and wrists. When they finally cut him loose, he rejoices again. This time, hanging in the air fixed his back, so he thanked the guards. He finally capitulated when he was in the infirmary talking to a man who was accidentally castrated. When Wilder is told which doctor he is there to see, the castrated man said that was the one who worked on him. Wilder relented at that point. It was just hilarious. where Wilder's character is deaf and Pryor's character is blind. The final time they appeared together in the decade was in 1989 for “See No Evil, Hear No Evil.” I went to see that as part of the summer of 1989 when I saw a ton of movies in my first summer living in Edmonton. Wilder plays a deaf man while Pryor plays a blind man. Together they thwart a ring of thieves. The movie also featured a very young Joan Severance and Kevin Spacey. Wilder also appeared in other movies, such as “Haunted Honeymoon” and “The Woman in Red”, but I never saw either of them. “The Woman in Red” did feature the song, “I Just Called to Say I Love” by Stevie Wonder which beat out Phil Collins’ “Against All Odds” for an Oscar for best original song. I saw tons of commercials that focused more on Wilder’s co-star Kelly Le Brock than him. Wilder also directed “The Woman in Red” and “Haunted Honeymoon”. As the 1980s closed, the sun was beginning to set on Gene Wilder’s career. Gene Wilder really was a comic genius. His best work came in the 1970s with a pile of great comedies such as, “Blazing Saddles”, “Young Frankenstein”, “The Adventure of Sherlock Holmes’ Smarter Brother”, “Silver Streak”, and “The Frisco Kid”. They all showcased his great blend of facial gestures – especially those big eyes; physical comedy; and comedic timing. He would peak in the 1980s with “Stir Crazy”, which was a great movie that even spawned a short-lived TV series of the same name. Like everything, he eventually faded away as the good roles became fewer and fewer and he concentrated on directing, writing, and caring for his wife Gilda Radner, who was stricken with ovarian cancer. She would die in 1989. He would continue to work during her treatments, but after she died he devoted his energy to raising funds and awareness for cancer through a cancer detection centre and support group, both named in her memory. In a way it is kind of ironic that a man who made a name for himself by making people laugh, would suffer such sadness. Yet, he found love again, remarried and spent the rest of his time painting with water colours, writing, and doing charity work. It seemed to be a life well lived. He could always make me laugh. When he teamed up with Richard Pryor, they had this chemistry that made me just want to keep watching. They played off each other so well, taking turns as the straight man, and the laughs just kept on coming. They were the perfect comedy team.